The snubby is the quintessential defensive firearm; it was born of a need to have a compact, portable, concealable arm to defend a person’s life, and it’s been doing that job for well over a hundred years. What’s been missing, though, was a comprehensive guide to using it for that job. I took my experience in carrying and training with the snubby, added in my experience in teaching people how to use it efficiently, and the result is Protect Yourself With Your Snubnose Revolver! This is the “one-stop shopping” book for anyone who keeps a snubby for concealed carry or home defense. I start with the basics: how to grasp it, how to master the heavy double-action trigger, how to reload it efficiently under stress, and then go right into a training regimen — complete with detailed exercises targeted to helping you to learn those skills. While nothing beats hands-on training, this book will help you develop relevant, realistic defensive snubnose shooting skills even if you’re new to the gun. Get your copy of Protect Yourself With Your Snubnose Revolver at Amazon (paperback/Kindle versions) and at the Apple iBooks Store! P.S. : If you’re buying the paperback version, take advantage of the offer for an additional copy for your Kindle at only $1.99! On Amazon, scroll down the page and look for the Kindle MatchBook box! Hey Buddy!, I found this information for you: "Protect Yourself With Your Snubnose Revolver is available NOW!". 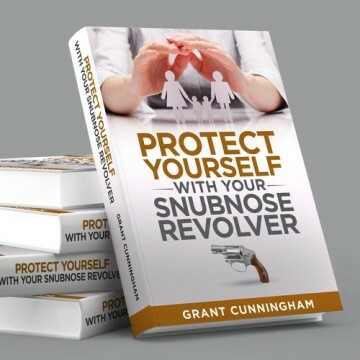 Here is the website link: http://www.grantcunningham.com/2017/01/protect-snubnose-revolver-available-now/. Thank you.